Want to design payment forms to collect more revenue for your business? Then you’ve landed at the right place!!! This article enlists the 5 best PayPal payment forms maker software which will help you in designing attractive payment forms. Moreover, the software also allows you to collect one-time as well as recurring payments in much safe and secure way. Below is the list of 5 best payment forms maker tools which allow you to make payments via PayPal payment gateway. FormGet is a leading form builder software for integrating forms, whether you need a simple contact form or a secure payment form. This software facilitates 260+ ready-to-use templates and an extremely easy to use drag and drop interface. FormGet supports major payment gateways such as PayPal and Stripe. This advanced feature will let you securely receive one-time as well as recurring Payments from your customers. Furthermore, the auxiliary feature will let you keep track of your viewers through a View Counter. 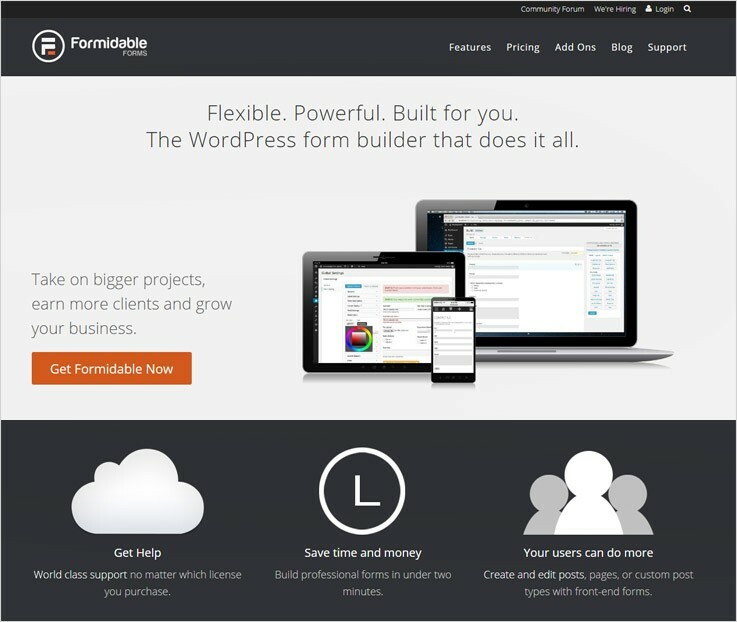 I have tried all the form builder software and found out that FormGet is the best software in each and every aspects like features, functionality, and pricing. This Form Building software won’t let you down when brought into practice. It posses advanced conditional & branching logic functionality to dynamically change the form fields when specific conditions are met. For advanced security, it provides SSL encryption, spam protection and reCAPTCHA. This software can create forms in many languages which helps you to connect your customer from any region. You can also use the canned replay feature as a response to the successful submission of a form in an automated manner. The FormGet software has 4 pricing plans. The form features vary in accordance with the number of users, forms and submissions/month. Free Plan- A entirely free plan to build a single form using with all the features. The user is completely free to use this form for any purpose to on any site. Starter Plan- A regular starter plan of $5 for a single user, a single form and 1200 submissions/month. Rookie Plan- A rookie plan of $35 for 5 users, 25 forms and 25K submissions/month. Pro Plan- A premium plan of $79 for 10 users, unlimited forms and 60K submissions/month. Advance Plan- An advanced plan of $99 for an unlimited number of users, unlimited forms and unlimited submissions. The Pabbly Forms software will let you build many types of forms such as payment form, signup form, lead generation form etc. The overall interface provided by this tool is very user-friendly and also facilitates many custom options to enrich the quality of your forms. After creating a form, you can easily embed the form to any site or page. Moreover, this tool provides a users dashboard to keep track of all your forms as well as manage them using a single interface. You can build forms & directly embed them anywhere on your site as a tabbed widget. Social media options are also available to share the forms on platforms to attract more users. There are two trusted modes of payment integrated into this tool the PayPal and the Stripe gateway. In-built autoresponder for auto response generation to form submission. No manual emailing required because now notifications are automated. The Pabbly Forms has four different pricing plans. The plan features vary on the basis of the number of users, forms & submissions/month. Free Plan- A dadicated plan to test the advanced functionalities through a single form. Starter Plan- This plan will cost $5 for one user, one form & 1200 submissions/month. Rookie Plan- It will cost $35 for 5 users, 25 forms & 25K submissions/month. Pro Plan- The pro plan will cost $79 for 10 users, unlimited forms & 60Ksubmissions/month. Advance Plan- This plan will cost $99 for an unlimited number of users, forms & submissions. 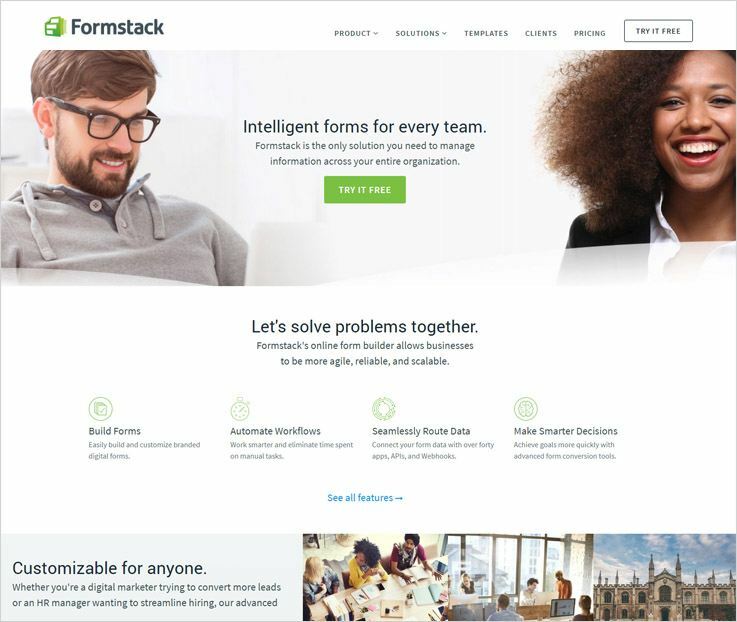 Formstack is an amazing online form builder software through which you can design simple to complex forms in few minutes. This software can be integrated with PayPal payment processor so you can easily receive your payment through a secure payment gateway. 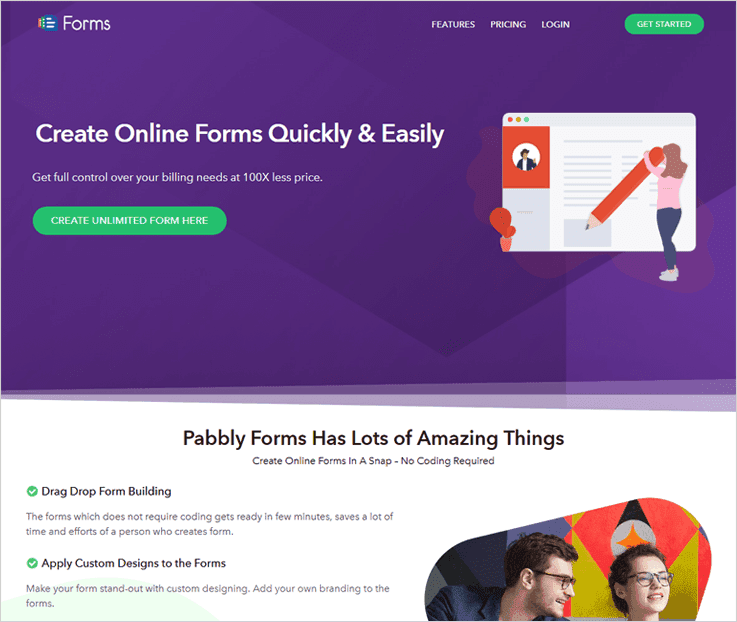 By using the Formstack tool, you can easily design beautiful and attractive online forms without any programming knowledge. Formstack’s export data feature enables you to arrange and export the form data in any other format. This form maker software provides e-signature facility so you can easily add an electronic signature field in any of your forms. Bronze Plan – This plan costs $19 for a single user, 5 forms and 700 submissions. Silver Plan – The Silver plan will charge $32.50 where you can create 20 forms, can have 5 user access, and accept 1000 submissions. Gold Plan – Under the Gold plan, you can create 100 forms, 10 users access, and accept 10,000 submissions and it will charge you $82.50. Platinum Plan – The Platinum plan would be charged $207.50 and allows you to create 1000 forms, 25 users access and 100,000 submissions. 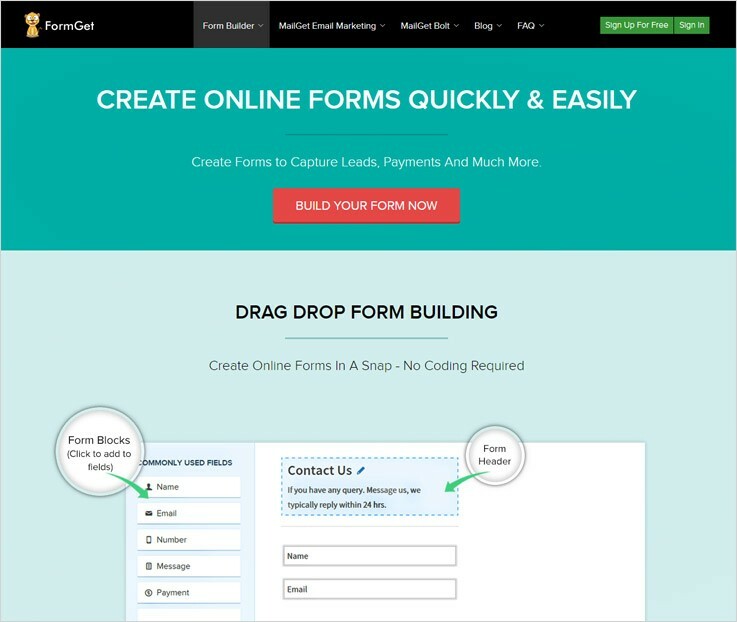 FormAssembly is an awesome form maker tool which enables you to create forms through which you can generate leads, collect payments & customer information easily. This form builder platform is trusted by giant companies like Amazon, Volvo, Suntrust, Lenovo, Merck and many more. 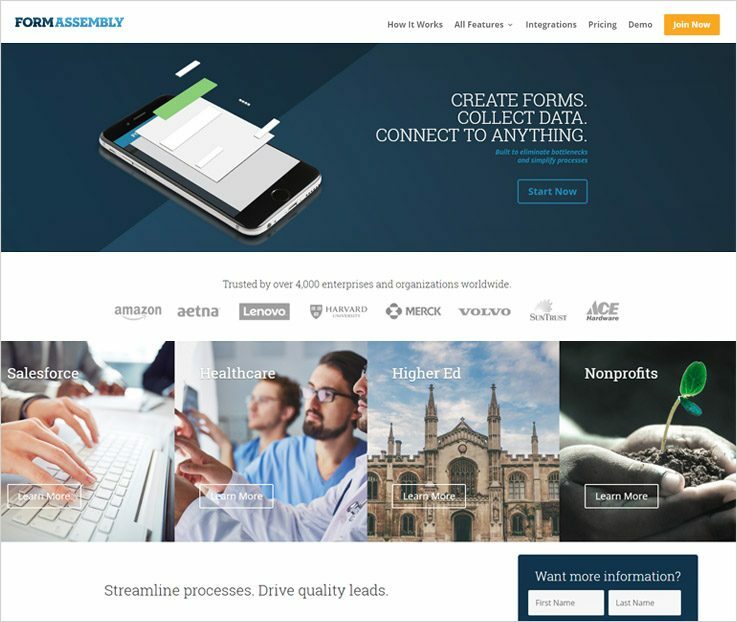 Form Assembly form builder tool provides a number of integration including Stripe, Authorize.Net, Salesforce, WordPress, Google apps, Drupal and more. Consequently, it enables you to connect your form with other services easily. With the help of the software, you can automate your form’s availability by setting a date range. Also, you can customize the unavailable message which shows when your form is no longer available. When someone fills out your form, you can send customized email notifications to the users automatically with the help of this software. Professional Plan – Professional plan charge you $89 per year ($99 on the monthly basis) and gives you live chat support, salesforce connector, file attachment, email notification functionality etc. Premier Plan – Under the premier plan, you will be charged $224 per year ($249 on the monthly basis) and provides you live chat support, advanced prefilling, e- signature, API & connector facility. Enterprise Cloud Plan – This is the most popular plan which charges you $599 per year and allows you to manage user & permissions, single tenant hosting, CAS authentication, live chat support etc. Compliance Cloud – Compliance cloud gives you live chat support, HIPAA compliant, PCI DSS level 1 certification. For pricing details, you have to contact FormAssembly sales team. 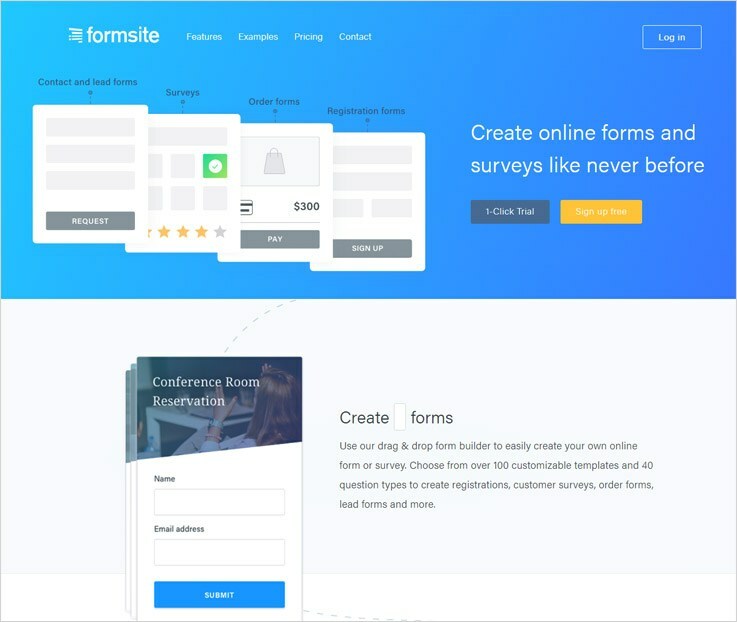 Formsite is user-friendly form creator tool which supports major payment gateway – PayPal through which you can accept payment from the customers securely. The software also allows you to create a survey and lead forms as well. This software provides you file upload facility by which user can submit documents, pictures, videos and additional information via the form. Through this form builder tool, you can track your online form performance as well as analyze your results in a chart, graph, and table formats. Formsite allows third-party integrations such as Dropbox, Google Sheet, MailChimp, Salesforce, Onedrive, Zapier etc which can help you to improve your workflow. 1. Free Plan – In this free plan, you can create 5 forms and accept 10 submissions per form and 50MB file space. 2. Deluxe Plan – The Deluxe plan will charge you $149.95 per year ($14.95 on monthly basis) and give you 5 forms creations, 500 results per form and 500MB file space. 3. Pro 1 Plan – This plan would charge you $249.95 per year ($24.95 on monthly basis). And allows you to create 10 forms, 1GB file space and get 1000 forms submissions/form. 4. Pro 2 Plan – Under this plan, you are able to create 25 forms along with 2500 forms submissions per form, and get 2GB file space. It will charge you $499.95 per year ($49.95 on monthly basis). Another wondrous form maker tool which allows you to create professional forms within a minute is Formidable. It provides you all the features that you need, to build powerful forms. Moreover, you can integrate it with other services including Bootstrap, MailChimp, AWeber, WooCommerce, Zapier and more. This software helps you collect various information about your customers by simply putting an upload field into your form and can gather data like images, videos, resumes, etc. Get full control of your forms with a comprehensive import & export function. With it, you can export forms, entries, views, and style individually or in a bundle. The forms which are designed using Formidable software are 100% responsive and mobile friendly. Personal Plan – The Personal plan will charge you $49 per year. You will get 1-year ticket support, 1-year plugin updates, and standard support. If you want more advanced features then you can purchase add-on separately. Professional Plan – In the professional plan, you would be charged $99 per year. It will provide 3 sites visibility, 1-year ticket support, 1-year plugin updates, and standard support along with 5 premium add-ons. Small Business Plan – For the small business plan, you have to pay $199 per year. It gives you 15 sites visibility, 1-year ticket support, 1-year plugin updates, and priority support along with 15 premium & advanced add-ons. Enterprise Plan – Under the enterprise plan, you would be charged $399 per year. It gives you unlimited site accessibility, 1-year ticket support, lifetime plugin updates, and elite support along with 20 premium & advanced add-ons. In conclusion, finding the best form builder software is a tough task. That’s why we came up with this article. Above, I have mentioned 5 best PayPal payment forms maker tools which allow you to create payment forms to collect online payments easily and securely. I hope above-mentioned form maker tool list will surely cut down your search and you will get perfect software for your business.